Don't miss out on any of the exciting news happening at World of Isabella Inc. Join our mailing list today! On January 8, 2011 Tonessa West Crowe was interviewed by WTHE radio station. 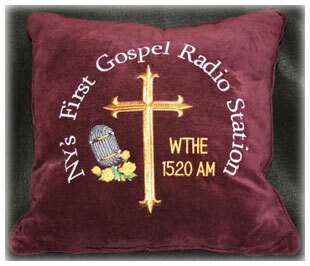 The pillow was a gift to www.WTHE1520am.com for interview. This pillow was created out of heavy cotton velvet with metallic and polyester threads for durability. It was a show stopper, created exclusively by World of Isabella Inc. We will be having future interviews on WTHE. Listen for future broadcasts! Free admission with early registration! Lots of fun and lots of giveaways!